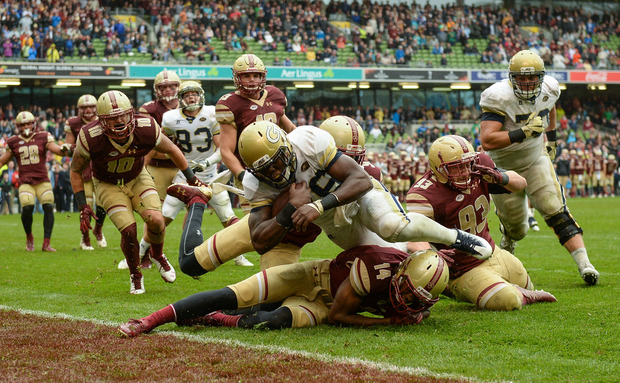 Plans for an American College football series at the Aviva stadium which will provide a €250m boost to the economy have been unveiled. The series will kick off with the return of Navy versus Notre Dame which will take place in August, 2020. The previous game featuring the two teams took place in 2012 and saw 35,000 fans travelling from the US. The fixture is one of the oldest rivalries in College football, with Notre Dame winning the previous showdown 50-10. This Saturday the two teams will play their annual head to head game in San Diego. Aer Lingus will be the title sponsor of the five game series with other fixtures and teams to be announced later.